Training with kettlebells is extremely effective in engaging major muscle groups through complex complete body movements. For functionality, challenging both the muscular and cardiovascular system, developing balance, coordination, strength and power, you can’t go past training with Kettlebells. Force USA Vinyl Kettlebells are created from a cast iron mould then powder coated black to protect from rust and dipped in vinyl coating and printed to display the weight size. 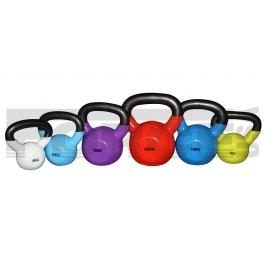 The vinyl coating provides colour coding for the size, protects the kettlebell from damage, protects your floor from damage when placing on the ground and reduces noise from clashing when using two kettlebells.